This week we’re talking about Google Map’s new feature: a Question and Answer section! This is GREAT because it’s promoting easier communication and understanding between what local businesses offer, and what customers are looking for. Something to make clear, though: this feature is currently only available for Android. But, these questions and answers are viewable to anyone who’s viewing the Google Maps listing. Those using iOS and looking for it on the web interface can look forward to its availability in the near future. On the Google Maps Q&A Section, questions and answers will be displayed for all to see, with room for anyone to leave their pressing question, or engage by leaving a ‘thumbs up’. This is bringing interaction to Google local business listings to a whole new level! 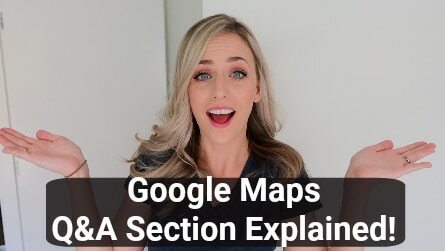 *The business will need to have access to Google Maps for Android in order to get the push notifications notifying them when someone leaves a question, or answers somebody else’s, or leaves a ‘thumbs up’ (which, I’ve said, is a really cool feature)! Write out questions and answers to some of your most frequently asked questions. Review them, and get them posted! Starting early will leave more opportunity to get these questions up-voted before this feature hits a wider audience and gains more exposure. *Make sure these are not just random questions, but they’re actually the most frequently expressed concerns by your audience, and answer them appropriately. Remember that people will be scanning the majority of the time, so it’s important to make sure your questions and answers are concise, brief and straightforward, being sure to also understand your customers may not be familiar with your company’s terminology (aka be easy to understand)! And remember- while this can be great for you and your business, negative and just weird questions might come up. Be prepared to flag these and take the necessary steps toward removal by familiarizing yourself with this new feature. Get out there and take advantage of this new feature! If you need help building a website, or getting more traffic to your online business, contact us today!